As part of the opening weekend celebrations we have revealed two site-specific commissions by artists Tim Etchells and Paul Morrison. Different Today by Sheffield-based artist Tim Etchells is a categorical statement executed in a combination of steel letters and LED bulbs. The installation announces boldly that ‘Everything is Different Today’ underscoring and questioning the idea of constant change. Through simple phrases spelt out in neon, LED and other media, Etchells strives to create miniature narratives, moments of confusion, awkwardness, reflection and intimacy in public and gallery settings. 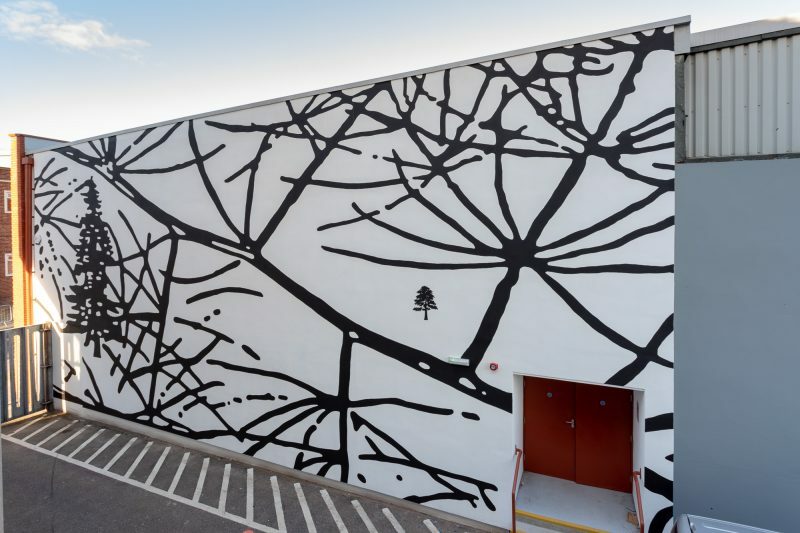 The second commission, on the exterior façade of Site Gallery, will be a 9m x 15m Paul Morrison, a contemporary British artist internationally renowned for his appropriated monochromatic site-specific wall paintings, paintings, sculptures, films and prints. Morrison’s wall painting entitled Horsetail has been constructed with modified found imagery from the artist’s extensive archive, which has been scanned and manipulated in Photoshop. The wall painting is part wall painting by of an exchange Morrison recently undertook in Kangkangee Arts Village in Busan, South Korea and looks to blur the language of the landscape painting genre and stretch its parameters.